Peter Gleick is scientist and freshwater expert as well as a MacArthur Foundation "genius." He drinks tap water. Why don’t the rest of us? 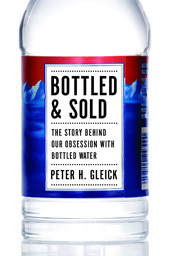 "Bottled and Sold: The Story Behind Our Obsession with Bottled Water" follows how water went from being a free natural resource to one of the most successful commercial products of the last one hundred years—and why we are all poorer because of it. Water is big business. Every second of every day in the United States, a thousand people buy a plastic bottle of water, and every second of every day a thousand more throw one of those bottles away. That adds up to more than thirty billion bottles a year and tens of billions of dollars of sales. "Designer" H2O may be something to laugh at, but the debate over commodifying water is serious. It comes down to society’s choices about human rights, the role of government and free markets, the importance of being "green," and fundamental values. Gleick gets to the heart of the bottled water craze, exploring what it means for us to bottle and sell our most basic necessity.